Livingston bus 4/11 leaves Caley Club at 9.45, Stadium 10.00. Book through Facebook or on 07462218717. Let's get behind the team. Should we get TNS, chances are the game will be on a Sunday at 3ish for S4C. Should the roads be clear, and with a 20 minute stop every couple of hours, the journey could be made in about eight hours. If the game is at three, the bus could leave at 6am and make it with about an hour to spare. If the game finished about 5 (as long as there's no extra time), we could get back to Inverness about 1 or 2am. Providing D&E lease the coach for that distance (and we'd probably need two drivers) but it could be done in one day. For those looking at making their own way down, taking the train looks more trouble than it's worth (and would take over twelve hours!). 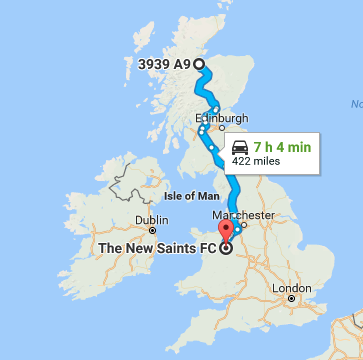 Contrary to popular belief, TNS do not play in Wales, but a few miles on the other side of the English border. From Inverness, it'd be three trains, walking and then a bus journey! Another option is to fly direct from Inverness to Manchester and then travel down but again it could be quite difficult as Oswestry has no railway station due to the Beeching Cuts in the 1960s. Also watch out for news of reduced fares in 2018. Great day out for Supporters Travel Club yesterday apart from the result on the pitch. Although the referee was comedy gold. Most welcoming stadium award - if such a thing existed - must go to Cappielow. Well organised staff and stewards. And everyone was really helpful and friendly. On to Brechin next Saturday for the last game of the year. Thanks to the generosity of Willie Finlayson who has kindly sponsored the Brechin bus we are able to offer members reduced fare of £5. Bus leaves Caley Club at 9.45 and stadium at 10.00 with pick ups in Aviemore and Perth. The winners of our end of year raffle were as follows: W Murray, R Bain, G Cowie, G Crosbie, J Tomney, E McIver, R Webb, G Gordon Jnr. Thanks to everyone who supported us by donating prizes and by buying tickets. We made £657 and plan another raffle in the Spring. Fares are now as follows: under 16, full time students, 65+ and concession £10 per head. Everyone else £20. There will be a special deal for Members towards the end of the season. Also watch out for date for Adult £20 and children go free. The bus for Dundee is getting nearly full - only 9 spaces left. Remember we are all volunteers, and can't always instantly answer. If you text us we will answer in time order. Text us on 07462 218717. Great news so many travelling! Bus on Saturday leaves Caley Club 10.30 and stadium 10.45. More bookings have been taken since last post so if you want a seat either phone or contact on Facebook. How many buses do you run . Just one? We run a bus to every away game .if there is sufficient demand we sometimes run a second . Reduced fares are now in place . Just to reassure everyone that whatever date is eventually fixed for Dunfermline game we shall be running a bus. Well done to the team on reaching the final of the Challenge Cup. Once we have details of final we will sort out leaving times of Supporters Bus. Cup Final bus 24th March leaving Caley Club 12.15, Stadium 12.30. Remember there are 4 away trips before the Cup Final. Please book these as well as the cup final. Also we need to know all the names in the party for which you are booking, and where you want be picked up from - Caley social or the stadium.